The VisualDOC software system allows users to quickly add design optimization capabilities to almost any analysis program (commercial or user-supplied). The powerful, intuitive interface and state-of-the-art optimization algorithms let users set up, solve, and postprocess designs. VisualDOC performs design tasks by calling the built-in design modules to modify design variables and calling the external simulation program to evaluate responses. The design modules in VisualDOC include gradient-based optimization, Design of Experiments, response surface optimization, and non-gradient-based optimization. Probabilistic design and multi-objective optimization are also available. To facilitate easy coupling with simulation programs, VisualDOC provides VisualScript, the general graphical process integration tool, as well as direct interfaces to MATLAB®, Microsoft® Excel®, and Morpher. Once a design task is formulated, VisualDOC automates the solving process and provides a set of visualization tools for the user to monitor the solution process, postprocess the results, or perform a what-if study for design alternatives. 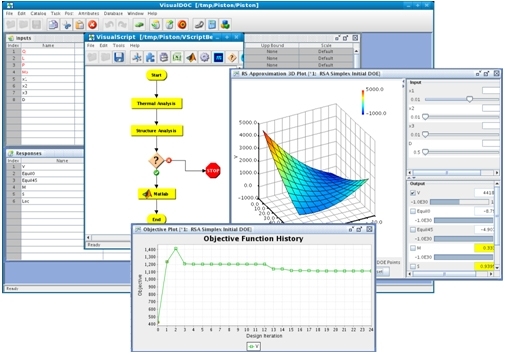 The VisualDOC-MATLAB Interface allows users to use the MATLAB computational engine to evaluate responses. Using the VisualDOC-MATLAB Interface, VisualDOC opens the MATLAB computational engine, transfers the design variable data to the MATLAB workspace, evaluates the responses using a user-supplied MATLAB file, and transfers the response values back to VisualDOC.